I’m writing a series of blog posts for Advent (yes, I know it’s July; my client plans ahead!). It is a challenge to find something new to say about such a familiar story, but that is forcing me to really read the text, and I’m learning just how much I have missed over the last four decades or so of hearing it! Last year I learned that the angel who came to Zechariah announcing John the Baptist’s coming quoted to him the exact words that had been the final words of the Old Testament. The first thing that God said after 400 years of silence was to announce the fulfillment of the last thing he had said. Wow. I also noticed for the first time the incredible, sacrificial love Joseph showed to Mary. Amazing. This year’s big revelations have been that the Magi didn’t ‘follow’ the star all the way to Jerusalem (read more here) and, today, that Simeon wasn’t a priest. I knew that Simeon had been waiting for the Messiah and that the Holy Spirit had revealed to him that he would see Jesus before he died. I always assumed that meant he was very old, but that’s not really borne out by the text. I also knew that he went to the Temple on the day Jesus was brought there to be presented to the Lord, and that that was due to his paying attention to the prompting of the Holy Spirit, but I was certain he was a priest. I thought he was likely to be in the general temple area, and just went out into the courtyards from wherever he had been performing his normal priestly duties. But no. 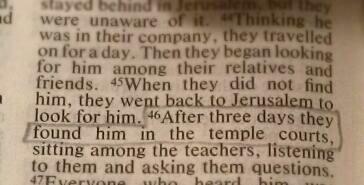 He was just ‘a man in Jerusalem’ (v25). Simeon’s devoutness hadn’t resulted in him getting work in the temple. I don’t know if it worked like that anyway – perhaps he wasn’t from the right tribe to be a priest (if that was a thing? ), but whatever, he was just some man, going about his daily life. Somehow that makes it seem more impressive, to me. I think we expect those who work for the church or in ‘Christian professions’ to be listening out for God’s word to them all the time, but not just ‘ordinary Christians’ getting on with our ‘secular’ lives. Sometimes, this story tells me, it is those who aren’t caught up with the busyness of ‘doing religion’ that are more open to the promptings of the Spirit. Yesterday someone pointed something out to me and my mind is still reeling from it: the boy Samuel DIDN’T serve God in the Temple. All those Sunday school images of vast stone columns and marble floors are entirely false. I’ve always pictured Hannah weeping and praying for a son on a huge flight of stone steps, but she couldn’t have been. And while we’re at it, there’s no textual evidence that Eli was sleeping in another ‘room’ or place within the tabernacle as I’ve always imagined. He could have been in the very same space as Samuel and not heard the voice of the Lord. There’s nothing particularly deeply spiritual I have to say about this, just one of those moments where my life-long perception has been shown to be false. I wonder what else I’m picturing completely differently from how it was…?! This verse was in one of the readings in church yesterday, and it struck me for the first time to wonder exactly where Mary and Joseph were looking for those three days. I’ve been to Jerusalem; it’s not that big. I imagine a parent seeking a lost child would try to think where he might go, try to remember the things he most enjoyed doing, the places he most enjoyed seeing, the people he most enjoyed visiting… Apparently there were three days’ worth of things Jesus had enjoyed in this little, bustling town. That’s consistent with what we read about him in later life; this Jesus who ‘came eating and drinking’, who was more likely to be at a dinner party with ‘sinners’ than sitting in the temple courts debating with the scholars. It also seems to suggest Mary and Joseph’s place in the social strata of Jerusalem – none of the friends whose doors they frantically knocked asking if they’d seen Jesus said ‘my husband said he was in the Temple courts yesterday’. Jesus must have gone back to someone’s home in the evenings and slept somewhere, but no one Mary and Joseph knew had seen him or even, it appears, heard tell of this young prodigy who was causing such a stir. But how did it take them so long to even think to look in the temple for this child who they knew was the promised Messiah? Had it become commonplace to them to have Emmanuel with them? Had they forgotten who he was? Had he simply enjoyed every part of the Passover feast so much that they couldn’t narrow it down to his favourite places? This is in the section where Stephen has been brought before the Sanhedrin and is being accused by false witnesses. His enemies have made up charges against him and persuaded people to make these false accusations. If you’re going to go to all that trouble, you want to be sure that the man gets convicted at the end of it, so you’re likely to accuse him of the things that strike most deeply at the heart of what those in power hold dear. So what do they say Stephen has done? 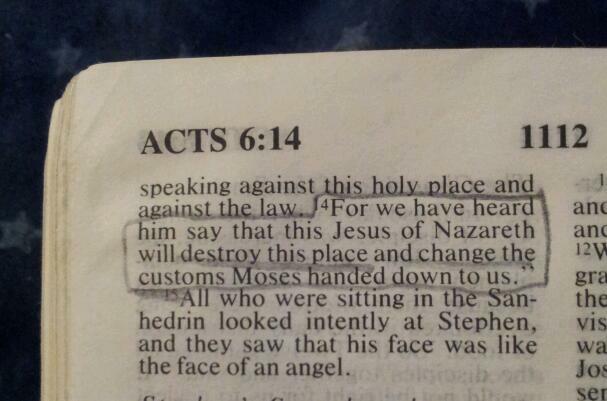 They say he claimed that Jesus would destroy ‘this place’ (the Temple) and change their customs. This seems to suggest they cared more about their building (the seat and symbol of their power) and their traditions than the law and truth of God. I know the Temple did hold greater significance for Jews than a church building does now, but it seems very much as though what had once been revered as a holy place, the dwelling place of God on earth, was being worshipped in place of the God it was supposed to point to. And the fact they talked of the customs of Moses rather than his Law suggests that here too they had lost sight of the purpose of what had been handed down to them – they loved the tradition more than the truth it was supposed to point them to.